As an outdoor adventure activity Aquaseiling is one of the best. 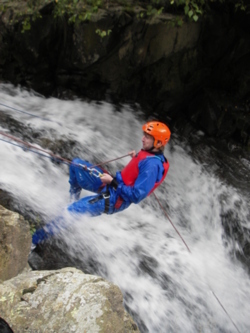 Abseiling down waterfalls is a fantastic alternative adventure activity. We use some of the best aquaseiling venues in the Lake District and around Cumbria. 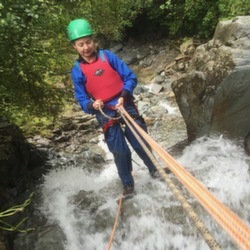 As with abseiling, you will be kitted out with a harness and a helmet for the aquaseil and then attached firstly to a safety rope and then to static abseil rope using a figure of eight and a karabiner. Using the figure of eight you will make your way down the aquaseil at your own pace. With an instructor holding the safety rope this ensures your safety at all times. You won't feel nervous, our team of highly trained staff will talk you through the aquaseil activity and make you feel at ease. All specialist equipment is supplied for the aquaseil, a wet suit, waterproof trousers and a waterproof jacket all you need to bring is spare boots or shoes and a swimming costume! Reviews for Aquaseiling - I have never done this before and was way out of my comfort zone but Dave was very patient and encouraging and I had such an awesome time. I really enjoyed it. 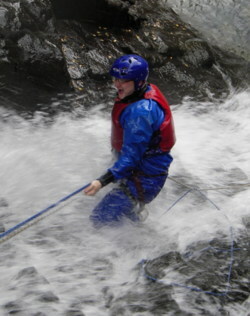 If I'm back in the Lakes I will definitely book on with adventure 21 again!! !